Baker Brothers is happy to announce that we have earned the EBSCO Best Pick Report Certification for the seventh straight year. We have a 5 star rating based on 518 customer surveys conducted by Best Pick Reports. 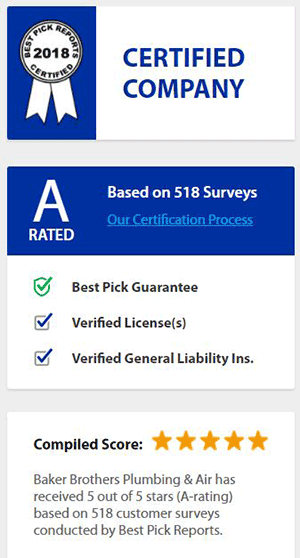 Best Pick Reports is dedicated to giving objective, third-party data that lets homeowners find top-quality companies servicing their neighborhood.